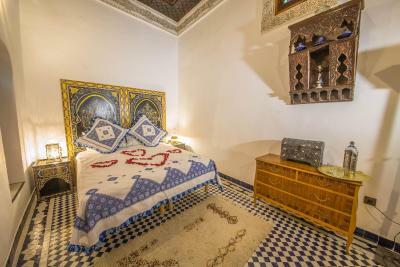 Lock in a great price for Riad Ouliya – rated 9.1 by recent guests! 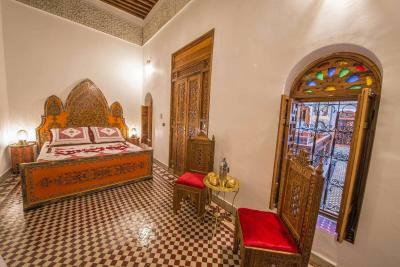 Beautiful Riad. Simple breakfast but correct. Really nice and very friendly staff (they picked us up from the Parking) and really good wifi. Well located in the medina close to R'cif gate. Parking close by for 20 dirhams per day. Room is big and clean. 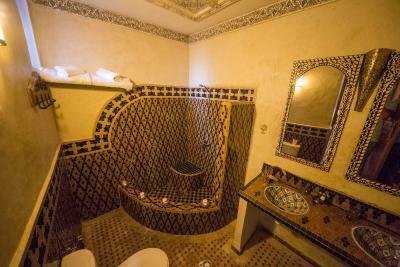 This was the perfect Morocco Riad (or Dar) experience. 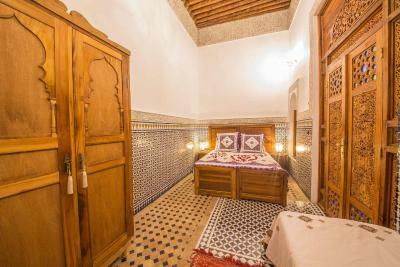 Absolutely stunning interior, excellent food (especially dinner), very comfortable/clean bed and bathroom (with fully functioning heater/hot water for winter months), and perfect location for our needs, a minute or two walk from Bab Rcif. Staff was friendly and helpful as well. 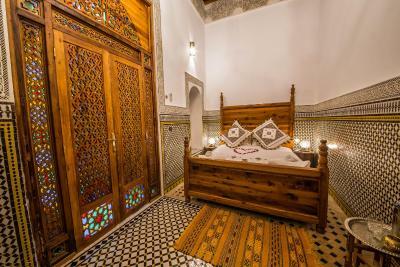 This is a wonderfully restored riad. The interiors are amazing and breathtaking. Also a great roof terrace. The room was clean and beautiful. Thoroughly enjoyed our stay at Riad Ouliya. Staff was really accommodating especially Adam (with a beard). 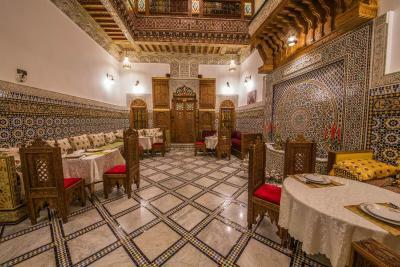 The is beautifully decorated and the food in their restaurant is the best we’ve had throughout our stay in Fes. What a pleasant experience! Beautiful rooms, comfortable and very clean! We ate dinner and breakfast there, was very good! Adam with the beard was such a pleasure to deal with, very helpful and outgoing. The owner was also very helpful and friendly and set us up with a tour guide last minute. 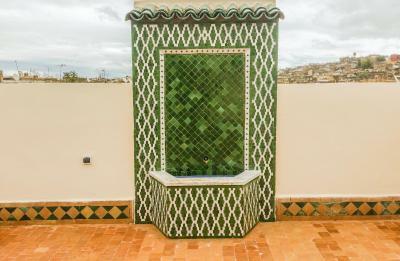 Couldn’t have had a better experience overall and HIGHLY recommended to anyone staying in Fez! The staff is very friendly and helpful! 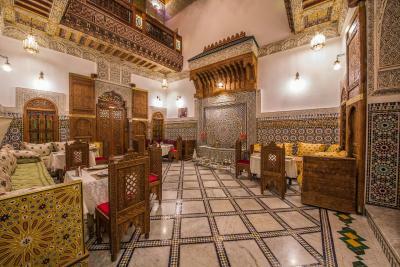 The restaurant of the Riad serves excellent Moroccan food which we enjoyed both evenings. 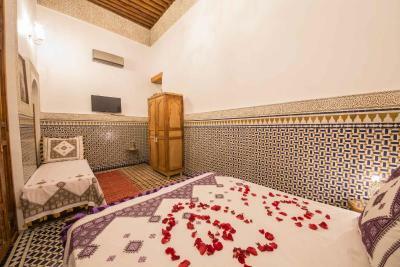 Although Riad Ouliya located at the edge of the old Medina, no vehicle can be parked next to the Riad. 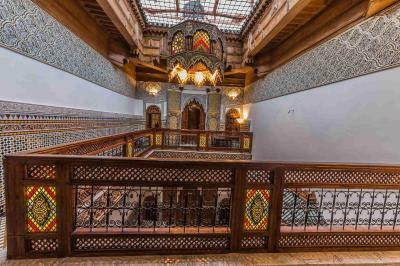 There are steps on the way to the Riad so it is difficult to walk with luggage, otherwise, it is just 5 min walk to the main street. The hotel staff will serve you mint tea and biscuits to welcome you. The Riad can arrange CTM bus station pick up service at a reasonable price if you have more than 4 people. 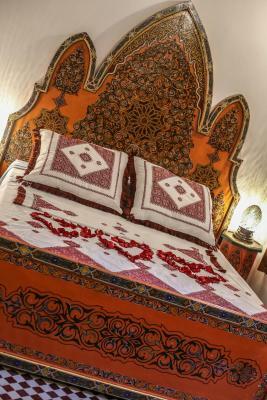 The Riad was very clean and beautifully decorated! Breakfast was delicious and we received great service. 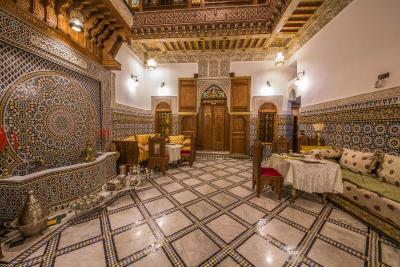 One of our top picks in Fez.Featuring a terrace, Riad Ouliya is located in Fez in the Fes-Meknes region, 2.1 miles from Royal Palace Fes. Among the facilities of this property are a restaurant, free shuttle service and a shared lounge, along with free WiFi. 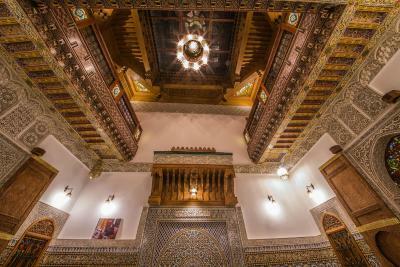 Batha Square is 1.4 miles away and Medersa Bouanania is 1.6 miles from the guesthouse. 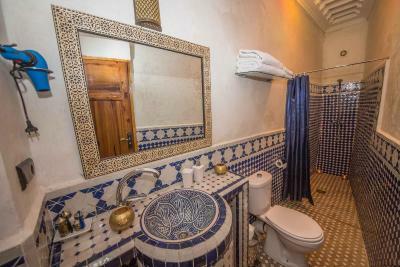 Guest rooms at the guesthouse have a flat-screen TV with satellite channels, DVD-Player, and a private bathroom with a bath and free toiletries. 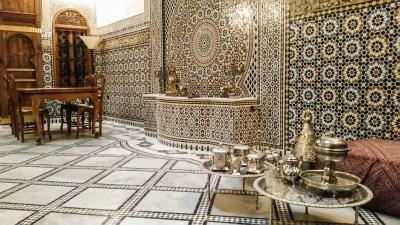 Riad Ouliya has certain accommodations with city views, and all rooms come with an electric tea pot. All guest rooms feature a seating area. Borj Fez Mall is 2.4 miles from Riad Ouliya. Fès–Saïs Airport is 11 miles from the property. 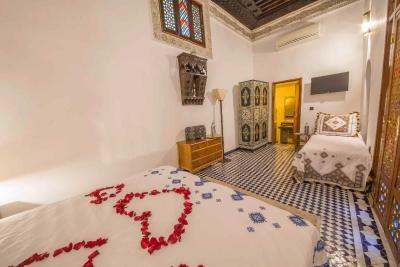 When would you like to stay at Riad Ouliya? Private parking is available at a location nearby (reservation is not possible) and costs EUR 1 per day. 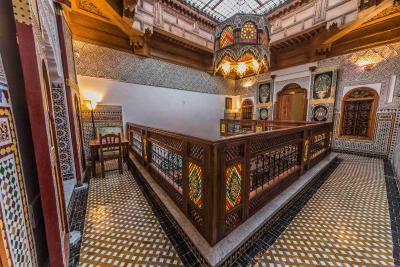 House Rules Riad Ouliya takes special requests – add in the next step! Riad Ouliya accepts these cards and reserves the right to temporarily hold an amount prior to arrival. The hotel is small but room is big. Room is cleaned every day.Good location, just go back to outside if you lose way, then follow the video which they sent. Everyone is so kind to me, treat me very well. They care me from check in to check out. The manager Saad is super careful about client. Adam and Ismail are both very helpful and polite. Kitchen ladies also super nice. Owners are friendly and helpful. Good price in Médina. Worth to stay. Good location. Attentive staff. A member of staff came and met us where our cab driver dropped us off. They gave us a packed breakfast when we had to leave early in the morning to join a tour. Nothing at all. Maybe not everyone would be comfortable with how close one’s bed is to the area where guests come to have breakfast and clients come to dine, but we didn’t find it a problem. Amazing location and incredibly well organised hospitality, especially for Morocco which can be warm but messy. 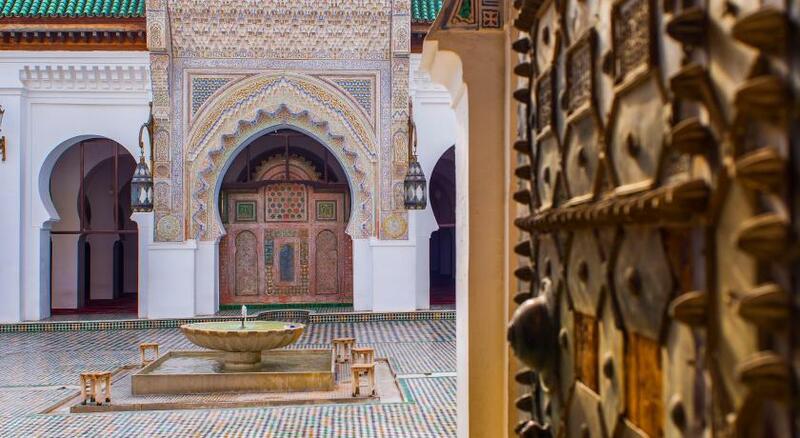 One is a fascinating walk away from most sights in the Medina, allowing for a quick visit of Fez even if your destination is somewhere else and you’re using the city as a stopover after a flight. We arrived very late at night after the usual Ryanair delay and were still shown to our very beautiful, comfortable and clean rooms by two very nice guys. The breakfast provided the next day was absolutely fabulous and the windy terrace has a stunning view of that part of the city. Smooth and professional. Payment could be done by card about services. Otherwise we need a lot of cash with us and that makes travelling not so comfortable. Great location, excitement about hospitality. That was our first stop after landing in Morocco. Staff was just great - rushed to meet us at the city gate and helped to go for safe parking, after carrying suitcase all the way to the Riad place in Medina. Great dinner at the place. Next morning we went for jogging - kind of unexpected running excursion to observe how the city is waking up. We got all the advices needed for great experiences. Great restaurant dinner on the roof terrace - recommended! Thank you so much for your hospitality. We really enjoyed our stay here. We will recommand you to our friends and We cannot wait to go back. THANK YOU! 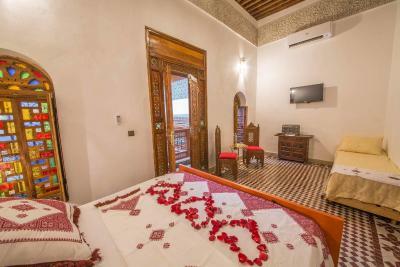 Riad Ouliya is truly a home away from home. 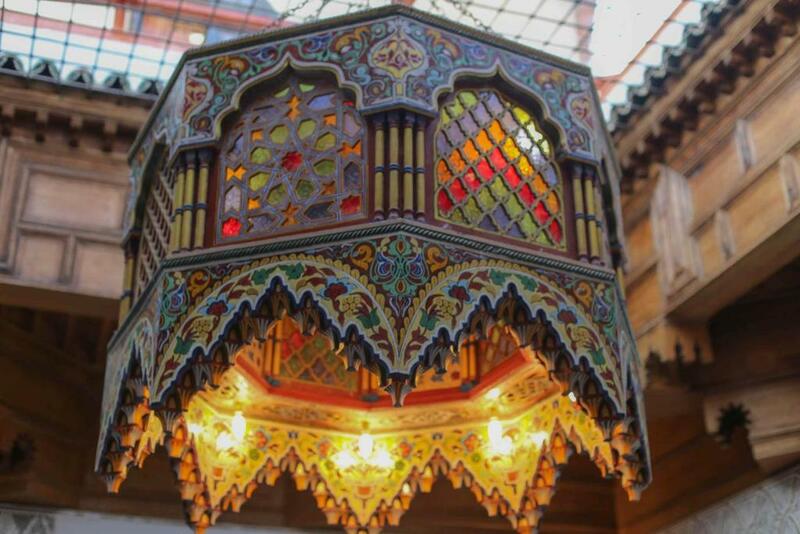 The first thing that caught my eye was the beautiful decor and the gorgeous central ceiling lamp, which actually made me choose this over dozens of other Riads :) But there were many other reasons to be happy about my choice! The location is central and easy to reach from the Medina main gate, the service is consistently thoughtful, and the staff are lovely! Rachid takes a personal interest to make sure all his guests are happy and feel special, and the cheerful, smiling staff do all they can to make you feel welcome! From Moroccan tea served at all hours to delicious food in the restaurant, this place is a winner. Look no further! We actually left with great reluctance and will definitely visit again! Beautifully decorated and restored! Good breakfast, helpful staff. Excellent food , staff, location .Will come back again.Dinner served on roof top was the highlight of the stay .Must eat meat balls and lamb Prune tagine , since it was our special day they were kind enough to get us cake . Breakfast was good but could have been better . 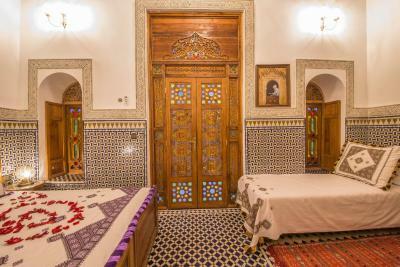 We stayed in Riad Ouliya for 2 nights after our desert trip in Merzouga . Our driver called the Riad and they immediately sent Mr Siddique to receive us who helped us with our luggage and guided us to the Riad . As soon as we arrive we were greeted with mint tea which was quite refreshing after long drive . Mr Rachid can fluently speak English and he helped us with all the formalities including the places to visit with map and also asked if we need a guide . 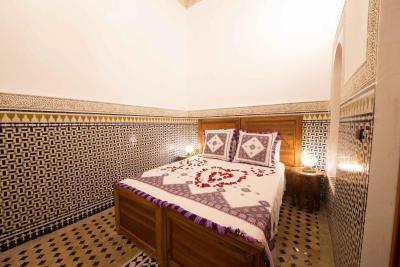 Riad is very beautifully decorated right from the sitting area to the room . The AC in the room was good enough to keep us warm . The dinner was very delicious and the sitting area was made extra cosy due to the additional heaters . Adam served us with food , always cheerful and ready to help . We had problems with our TV remote , Adam and Mr Rachid immediately came to the room and fixed it immediately. Also there is a nice view of Madina from the terrace. 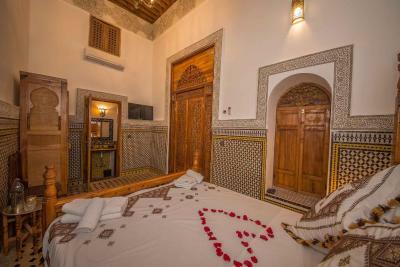 Overall we had a wonderful stay at the Riad and would like to visit again if we go to Fes in future .I would highly recommend this Riad to anybody looking to stay in Fes . 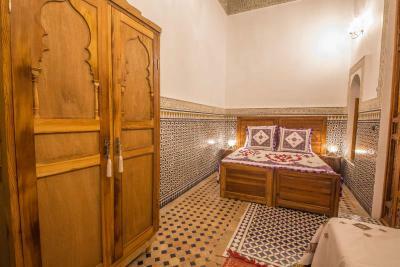 Beware of the "guides" who offer you to take to the riad from the parking space will ask for money quite forcefully even if they promise not to ask for any at the beginning. 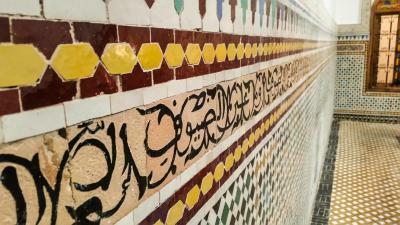 The riad is not very hard to find if you can read the map. Fantastic location! 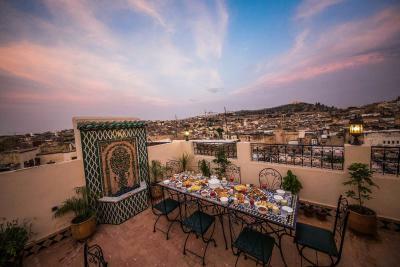 We loved our beautifully decorated rooms, amazing breakfast, superb view of Fez and the Medina from their roof terrace. 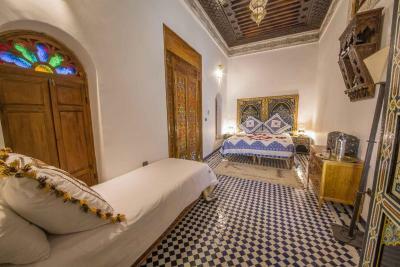 We had a wonderful stay at this beautiful Riad! We will definitely go back.